Contains Field-Tests from: George Saunders, Karen Abbott, Michael Bierut, Randy Cohen, Jonathan Eig, Ben Greenman, Kevin Guilfoile, Steven Heller, Joe Meno, Debbie Millman, Jim DeRogatis and dozens more. Because we were itching to give book publishing a try, we're offering the Field-Tested Books collection in a handsome trade paperback. 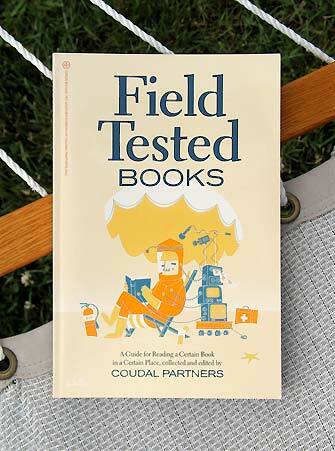 Spanning the globe, and nearly 200 pages, the Field-Tested Books book contains three years of reviews; 143 entries from more than 90 contributors. Take it to the beach, use it to plan your next literary vacation, or keep it in your library for quick reference. All prices USD. Shipping via FedEx Ground in the US and Canada, USPS mail everywhere else. Books and poster will ship in separate packages. All the reviews from The Field-Tested Books 2008 Edition are online and so are previous editions and submissions from readers too. 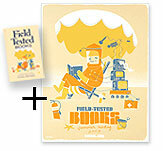 It's become a biennial tradition to ask great designers to create a poster for Field-Tested Books. This year we were very fortunate to have John Solimine of Spike Press create a special, limited-edition, silkscreened poster to accompany the feature. You can see what he's come up with here. The actual poster is 18" x 24," printed in four colors on 100lb French Construction White Wash and would look swell at your summer house, or at your regular home this summer. The edition is just 400, and 100 have already been promised to reviewers and "Blind Faith" buyers, so they're going fast! Add this to your cart. 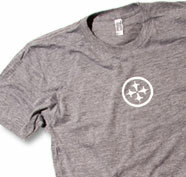 It's a super light tri-blend heather tee with a "unique texture that drapes against the body for a slimming look." Plus it's really comfortable for summer wear, with just a simple white "crois" on the chest. $18 each.